About the Book: Across the Confederacy, determination remained high through the winter of 1864 into the new year. Yet ominous signs were everywhere. The peace conference had failed. Large areas were overrun, the armies could not stop Union advances, the economy was in shambles, and industry and infrastructure were crumbling—the Confederacy could not make, move, or maintain anything. No one knew what the future held, but uncertainty. Myths and misconceptions abound about those last days of the Confederacy. There would be no single surrender or treaty that brought the war to an end. Rather, the Confederacy collapsed, its government on the run, its cities occupied, its armies surrendering piecemeal. Offering a fresh look at the various surrenders that ended the war, this book brings to light little-known facts and covers often-overlooked events. Each surrender, starting at Appomattox and continuing through Greensboro, Citronelle, and the Trans Mississippi, unfolded on its own course. Many involved confusing and chaotic twists and turns. Misunderstandings plagued many of the negotiations. Communications were problematic. Discipline often broke down. Tempers flared. It was anything but a nice, neat ending to the war. How did the war finally end? What was the status of former Confederate soldiers? Of slaves? How would everyone get home? Was there even a home to go to? As the surrenders unfolded, daunting questions remained. 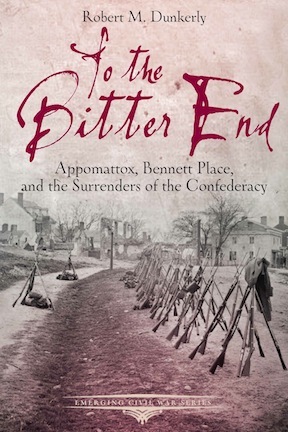 Appomattox was just the beginning. Emerging Civil War first previewed To the Bitter End on October 31, 2015. The book first appeared on March 5, 2015, with a sneak-peak from author Bert Dunkerly. About the Author: Robert M. Dunkerly is a historian, award-winning author, and speaker who is actively involved in historic preservation and research. He has worked at Appomattox Court House National Historical Park and is the author of The Confederate Surrender at Greensboro. He has spent years analyzing the final months of the war. Dunkerly, co-author of No Turning Back: A Guide to the 1864 Overland Campaign, is currently a Park Ranger at Richmond National Battlefield Park.